Okay, so I'm a little late with this month's While You Wait. I know, I stink. That whole moving and starting a full-time job thing kept me really busy. However, I'm loving being a real adult thus far. Anywhoodle. 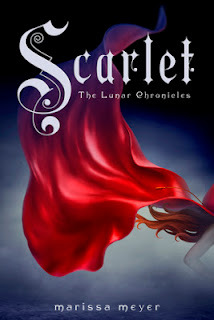 I'm very excited to be featuring Scarlet by Marissa Meyer this week. I'll be the first to confess that I still have not read Cinder, but I've heard nothing but phenomenal things about it and even better things about Scarlet, so I'm not too concerned about whether or not I'll love it. For those who don't know, Cinder is a retelling of Cinderella, and I believe Scarlet is a retelling of Little Red Riding Hood. Early winter is a great time to read fairy tale retellings because Misty of The Book Rat and Bonnie from A Backwards Story will be hosting Fairytale Fortnight in late March and early April. So, what do I think would probably good for readers who are also interested in Scarlet? Cinder seems like a pretty obvious bet. For those of you who don't know, Cinder is a futiristic retelling of Cinderella set in China. Obviously, one would need to read this before Scarlet. Personally, I still need to read Sisters Red, but I can imagine that for a lot of people, it would satisfy while they wait for Scarlet. Princess of the Silver Woods is another Little Red Riding Hood retelling. Jessica Day George has written tons of other fairy tale retellings as well, so you should definitely take a peek at GoodReads if you just can't get enough. I can tell from the premise of Cinder that's a very unconventional take on the Cinderella story. Ash is an LGBT retelling, also of Cinderella, so my guess is that readers who love Meyer's books may want to give this a shot as well. Bound sounds fascinating to me. This one is set in historic China, whereas Cinder is set in New Beijing. It'd be great to see someone compare both of the books in one post. Of course, maybe some of you don't just want Cinderella and Little Red Riding Hood stories. Maybe you just want all kinds of fairy tales conveniently mentioned in one book. If so, you definitely need to pick up Cloaked by Alex Flinn. And that's it. Those are the books I recommend picking up while you wait for Scarlet. What suggestions would you add to my list? I recently read Cinder, and it really was amazing. I was luckily enough to know someone who won an ARC of Scarlet, so I just read that. Another hit outta the park for Marissa Meyer. I don't even like science fiction but I loved both of these.